Surfside Two encompasses the top level of a Mediterranean-style duplex home that is just steps from the sand and ocean. 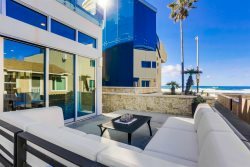 This Pacific Beach vacation rental boasts gorgeous ocean views from both inside the home and the spectacular rooftop deck with a 6-person hot tub, outdoor kitchen and dining and lounging areas. This home encompasses the entire second level of a duplex home and has a separate entrance and outdoor spaces. The spacious home is over 2500 square feet with a bright open-concept living area; an inviting, comfortable space, with cool tile floors and a gas fireplace that adds to the ambiance. Complemented by plenty of seating and a big screen TV, this is a nice space to relax and entertain after a long day in the San Diego sun. Just off the living area is a kitchen with white-water ocean views. Featuring stainless-steel appliances, granite slab counters and generous island where friends and family will gather. A dining table with seating for 6 is adjacent to the living room, with seating for an additional 4 at the island. A truly indulgent master suite is one of the highlights of the home. This space is furnished with a sumptuous king bed, a full sofa situated in front of a gas fireplace and wall-mounted flat screen TV. Two full walls of windows allow you to gaze at the blue ocean and a retractable door brings the outside in extending out to the private balcony with more outstanding views. The spa-like master bath is just as impressive. A deep soaking tub is in front of yet another fireplace, dual vanities and a separate frameless shower complete the space, plus a large walk-in closet is conveniently located across the hall! Bedrooms 2 and 3 feature a king and double bed, respectively. Bedroom 4 has a twin over twin bunk set, as well as a full-size sofa. These three bedrooms share a hall bath with a tub and shower. Access to the beach is just steps away down a sidewalk leading to a grass park overlooking the ocean. Besides the beach, Surfside Two is supremely located within walking distance some of the best restaurants, shops and attractions in Pacific Beach and it’s just a short drive or bike ride to the seaside village of La Jolla, or the lively beach town of Mission Beach and tranquil waters of Mission Bay. We urge you to contact us today to learn more and reserve this magnificent gem. Garage door opening: Width: 96" x Height: 82"
Pacific Beach is a laid-back community that encourages you to relax along the shores of the Pacific Ocean. Go for a leisurely stroll along the oceanfront boardwalk, shop at trendy Garnet Avenue boutiques, learn to catch a wave at Tourmaline Surf Park, reel in a fish at Crystal Pier or dance the night away at a nightclub. Head south to Mission Beach for the amusements or north to La Jolla for the luxurious boutiques and fine dining. Pacific Beach stretches with 3 miles of boardwalk and shoreline, with endless beach vibes and plenty to do for everyone. Please note: Pets allowed on this property with a non-refundable $100 fee for each pet. Size and breed restrictions. Must be pre-approved by owner.